One of the songs that resonates in my mind after decades of the original, animated movie is “A Whole New World”! 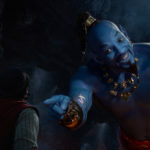 Now, I am excited to share that Aladdin is coming back to the big screen in a real-life version. Here is more information about the movie.